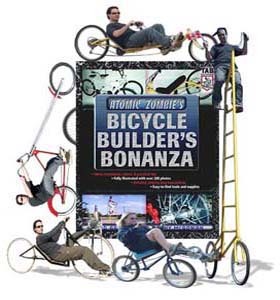 There are more additions to the Atomic Zombie Builders Gallery - long and short wheel base recumbents, choppers, motorized bikes, crazy bikes and more. The chopper above was sent to us from Paco Chopper in Mexico. This sick chopper was built by Chris Hooley of Australia. Scott Frey of Boulder, Colorado, sent in a picture of his crazy bike. 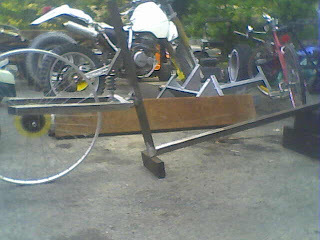 He writes, "This is a kinetic sculpture craft that I raced in the Kineticists.org Colorado race this year. It’s not an Atomic Zombie design, but it is kinda weird. You might like it for the “Fun Rides” gallery. I more-or-less threw it together in a few weeks using a kiddie bike, kiddie trailer, and a bunch of conduit. The official name of this machine is “Dr. Diabolical’s Tedious Tricycle of Tyranny”. It’s a lot of fun to ride, especially with the lever-steering!" 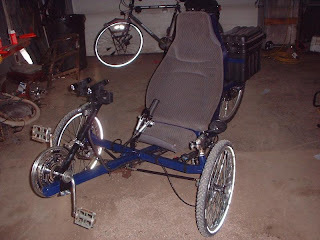 Geoff Bird from the UK sent in a picture of his racing short wheel base recumbent. You can see these and many more cool homebuilt bikes in the Builders Gallery. Guaranteed to motivate you to get bike hacking, grinding and welding. "I finished my StreetFox. The plans were a pleasure to use. I built it just as laid out in the plans. I installed the shock horizontally, just so I could use the neat bracket from the Mongoose 24” mountain bike I got for $10. I felt the front tube looks unfinished even with a cap. I cut a fingered end on it and pushed a 21 cell LED flashlight in. My seat is rubber pipe insulation about 1” thick with crocodile vinyl over. I also used 1 1/2” skate wheels for the chain guide (though in retrospect I wouldn't do that again – they work fine, but the chain can jump off when you hit big bumps). I added a few gussets, more for looks than anything. The bike is very comfortable, and I'm 6'4” and 270 lb. Between flame flex and the shock, the ride is great, even off-road." More of Tom's ride report will be featured in the April newsletter. Stay tuned for announcements. 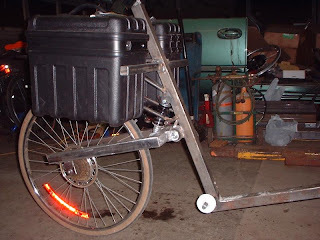 Although the front end of a bicycle is quite simple compared to many other types of vehicles, there are certain subtle angles that can affect the way a bike or trike steers. A few extra degrees of head tube angle can make a ride feel "twitchy", or too much rake can create something called "wheel flop". When building a bike from scratch, you may have to mess around with these angles in order to get your ride tuned exactly the way you like it, and you will quickly find out that there is no magic rule to getting it right without a little experimentation. Figure 1 shows your typical hardware store mountain bike, which has what I consider "typical" front end geometry that often works well for many home built projects. Although a more relaxed head tube angle is better for a longer cycle, you can't go wrong using typical upright bicycle front end geometry as a starting point when creating your own frame from scratch. Your first test ride will give your more useful data than any technical frame building guide or chart ever will. There are 3 angles of concern when working with bicycle steering, and they are shown in Figure 2. Head tube angle is shown (A), and is usually measured from a line taken parallel to the ground. A 90 degree head tube angle would be straight up and down, and a 45 degree head tube angle would be very relaxed, pointing your forks way out front like a chopper. Typical head tube angle on most upright bicycles is between 60 and 70 degrees. 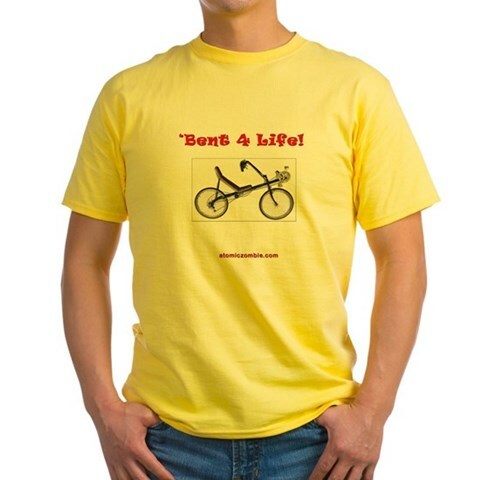 New trikes, recumbents (long and short wheel base) and fun bikes. Keep 'em coming, everybody. Practically every bike, trike or quad you will make will require some kind of freewheel in the transmission system. A freewheel is basically a sprocket attached to a ratchet, allowing the transmission to drive the wheel in only one direction - much like a socket wrench. Without a freewheel on a bicycle, you would have to pedal at all times, never able to coast. This type of drive system is called a "fixed drive" or "fixie", and is often used for strength training on an upright bicycle, where the rider works against the forward momentum in an attempt to slow or stop the vehicle. A similar fixed drive system would be found on a unicycle. Since every trike, bike, and quad on this website requires a freewheel, let's explore the inner workings of the device and learn how to salvage them from old bicycle wheels in order to make repairs or adapt them to trike axles. Removal or repair of a freewheel requires only a few basic tools as shown in Figure 1. You will need two wrenches to remove the axle nuts, and the home made Shimano style freehub removal tool, which we will discuss soon. A center punch will also be needed if you plan to take the freehub apart to re-grease the bearings or repair the ratchet system. Cone wrenches and professional freehub removal tools are also available at many bike shops, but i can tell you from experience that the simple home brew freehub remover is much better than the professional tool and will last forever. I have broken 2 store bought freehub tools, but have never had any problems with the home made remover. Before going any further, make note that there are two distinct types of multi-speed freewheels and hubs; the cartridge type as shown in the left of Figure 2 and the classic Shimano type shown on the right of Figure 2. Only the Shimano type of freehub can be used for trike or quad axle mounting as it can be removed as a complete working unit by unthreading it from the hub as will be shown soon. The cartridge style freewheel cannot be removed from the hub (only the chain rings), as the ratchet system is built into the hub as an integral unit. A Shimano freewheel is easily identifiable as it will have a recessed bearing race with two or more small holes in the ring that allow it to by removed. The cartridge steel freewheel will not have a visible bearing race, but instead a spline with several inner teeth. Cartridge style freewheels are usually found on more expensive wheels and aluminum hubs, whereas the Shimano style is usually used on lower quality department store bicycles, often having a steel hub. Around here, it's pretty crazy to ride a bike in the winter, but I've noticed more and more cyclists riding year 'round. On the one hand, it's great to see folks leaving the gas guzzler behind in favor of human powered transportation. One the other hand, it's a very dangerous mode of transport, considering the amount of snow and ice on our streets every winter. I regularly see a guy wearing reflective gear riding to and from his job, bundled up in thick clothing, huffing and puffing his way even in the most frigid temperatures. I wish I had that stamina! Nevertheless, I do admire those who are determined to ride their bikes all year 'round and wish them safe journeys. I'm just not brave enough to embark on winter biking journeys yet. Greetings everyone. 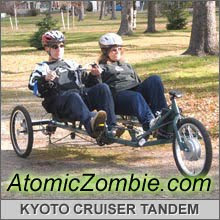 Received an email from Hans in Germany wondering if we have videos of our Atomic Zombie bikes, electric bikes and scooters online. He is especially interested in the Warrior Tadpole Trike video to see how well it handles. So, here's the Warrior Trike video for you, Hans. We also have over 30 other videos on YouTube . 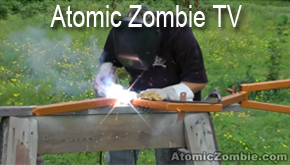 And, each project plan on the main Atomic Zombie web site has a video on the right side underneath the project description information. T-shirts, hats, mugs, water bottles, mouse pads, stickers, BBQ aprons and more! The second part in a series showing the Terminator Chopper Build step-by-step. What we're doing to stay warm and new stuff we're working on. Another new AZ adventure recently launched. More awesome additions to the gallery - choppers, recumbents, trikes, tall bikes, lowracers, and more. The gallery is nearing 1,000 entries! A hearwarming submission by an Atomic Zombie Krew member reminiscing about auctions, yard sales and building bikes with his dad, and passing wisdom to future generations. A class builds and races an Atomic Zombie trike, and is now setting its sights on a Warrior Racing Trike build for an upcoming competition. A new featuring profiling some of our AZ building community. Be a part of this informative adventure. An informative article on must-have tools for beginners. 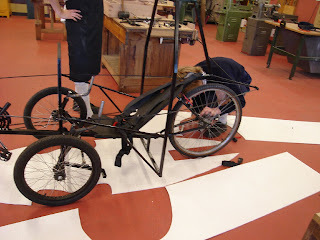 An AZ Krew member embarks on a bike building journey to transform a trike into a sleek electric machine. Don't forget to send in a picture of your completed bike projects to the Builders Gallery. We're social creatures. Join us! New & improved Builders Gallery now online! Here we grow again! The Builders Gallery has grown so much in recent years, it was becoming very difficult to manage and time consuming to update. We tested various gallery software, but we just couldn’t find the right one to work seamlessly with the new site layout. So, in traditional Atomic Zombie spirit, Brad took on the challenge of completely developing one from scratch. We didn’t keep track of how many hours it took to write, test and create the gallery pages. It was, however, an enormous undertaking that took over a month to complete. The other gallery was getting pretty bloated and slow, and looked disorganized. When we started it in 2001, we didn’t expect it to get so big so fast. Now, it takes minutes instead of hours to add new submissions and upload them to the main site. Woo hoo! That leaves us more time to work on other projects. We hope that you like the new format, especially how fast the pages and larger images load, and the menu organization. You will also notice that some bikes appear in more than one category. Just watched this excellent documentary by the Canadian Broadcast Corporation (CBC) called Google World on how Google began from its inception to the technological powerhouse it is today. The programme is about 45 minutes long, but worth watching. Google World goes behind the scenes at Google in North America and China to reveal why it now wants to take us all into the brave new world of "cloud computing." Whether you love or hate Google, it's constantly expanding into brave new worlds, innovative products and services, and it's here to stay. Safety issues - are we too paranoid? 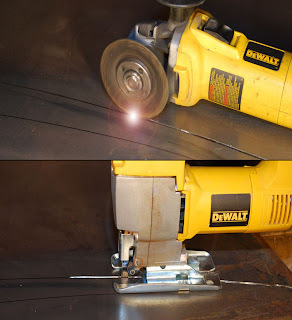 "I'm surprised in the Feb 2010 newsletter it shows a DeWalt grinder being used with a slitting wheel to cut a piece of sheet metal. It appears the grinder has no guard. Is this method considered safe? If that wheel shatters there could be serious injuries. Grinders are rather dangerous and removing guards seems wrong." "Yes, removing the guard will make the tool more dangerous. It is a risk I am willing to take because with the guard on, I would not be able to do even 1/10 of the things I do with my grinder. On the flip side, it forces me to always be aware of the dangers and use better safety gear such as a full shield over glasses. Each summer, I wear out more than 50 zip discs and at least 10 large grinder discs, so my grinder sees a lot of action. Even though a good face shield will stop an exploding zip disc (never seen one, though), I am always aware of the dangers and do not place my face over "the line of fire". Choosing to remove the guard is a personal choice, and I will never use a grinder with a guard. If you choose to do the same, spend your $$ and get a good pair of goggles as well as a full face shield. "Guards.....come on really we are backyard hackers." "Although safety is an important factor to keep in the front of one's mind at all times, each of us is responsible to guard our own safety, too. Too many devices designed to keep us "safe" may also cause us to be even more complacent, thereby actually increasing the hazards. So, as with all things you buy, read the instructions, heed the warnings, but ultimately how you use that tool is up to you. Be aware that any modifications to those tools may increase safety hazards." That small, black housing underneath the handle is the guard designed to protect the user from flying debris, especially the zip disc rotating at a high rate of speed. As with everything in life, safety is important. Read the manufacturer's instructions first and heed the warnings. If you're not experienced with that particular tool, take your time and get used to it. Note that any modifications to tools will likely void the warranty and may increase safety hazards. So, ultimately, how you use tools is entirely up to you. Regardless, proper work clothes and footwear, long thick gloves and full face shield are a must to protect you from flying debris. To keep or remove the grinder guard - that's up to you. It's a matter of choice. But, regardless, respect the tools, and always be aware of potential health and safety issues. You don't need to be overly paranoid; just be careful and use common sense. My name is Stephen and I am an Applied Technology teacher at Scotch Oakburn College in a regional city in Australia called Launceston. 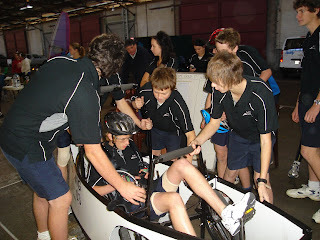 We run a recumbent bike building course for our year 10 students as a major component of their Applied Technology program. The bikes are then put to the test in a 6 hour endurance race in our state capital Hobart in May. 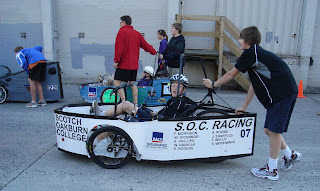 Last year we were very excited to find your plans for the Street Fox, ordered a set and 18 students set about building 2 bikes +roll bars for the 6 hour challenge. The plans were excellent and the bikes are a constant source of interest for students and visitors to our school. We have just received the plans for the Warrior and hope to build or modify our existing bikes for this year’s race on May 2nd as there seems to have been some good improvements for a race ready bike. I have included some photos of our bikes from race day; keep up the good work. Thank you for your kind words, and pass along our congratulations to the students. Well done! 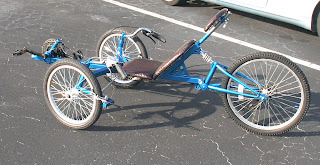 We look forward to reading about your Warrior Racing Trike build and upcoming race. Cheers. The purpose of this survey is to gather information on some of our Atomic Zombie Krew community members who want to be profiled in upcoming newsletters. We hope to have a "Get to know an AZ Krew member" section in each monthly newsletter. If your profile is chosen, you will be contacted by email to submit a picture of yourself and/or one of your completed bike projects. This survey is voluntary. If you do not want your information published, please do not complete this survey. Similar issue with the rear axle, it won't be 3/4 inch, but rather 20mm, actually a little beefier. People don't throw things out here like I saw in UK. So you have to do a deal of 'social engineering' to get people to part with that rusty heap they have in their storeroom. In theory, my little mini-lathe only does metric threads - but I believe I can get so close to 24TPI as makes little difference. There's a great little program called 'gears' by Paul Bussieres (just Google it) that shows that I should be able to get within 0.06% of 24TPI, or about 10 microns over the length of the freewheel thread, probably close enough! The other challenge will be turning the relatively large lump of metal (I got some 65mm bar yesterday) with the little machine. I went for aluminum alloy - I'm confident that it will hold up bearing in mind 'factory' bike bits are a lot less beefy and are also made from aluminum alloy. If all fails, I have tame local help from the nearby fix-everything metal workshop (from tractors to huge (90 tonne!) earth moving machinery) (plan B). Also looking at plan C which is the welded flange to bottom bracket cup. 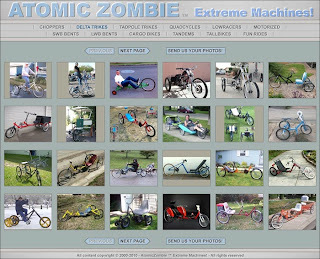 He just joined in July of last year, but Atomic Zombie Krew forum member, "nineball", is getting much deserved high fives and praise from our bike building community with his SWX-Elec hybrid Recumbent Trike. 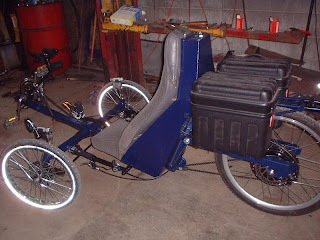 Nineball started building his recumbent trike in early October last year. He posted pictures and progress reports of his build on the Atomic Zombie forum sharing his ideas, and looking for advice, always posting pictures so we could all follow along and see the build progress. The community has been very impressed with his project over the months. It started off with a simple frame and quickly progressed: adding cranks, suspension, rear shock, pedals, steering system, wheels, box to house electronics for the hub motor, the seat, and so on. He says in his postings that he did spend a couple of "all nighters" working on it, but check out the amazing progress in such a short period of time. Wow - what an accomplishment! Nineball also plans to install two rear electric LED signal lights, too, which will be connected to the batteries located in the rear box. An excellent job! Hope some of you are inspired to get involved and get into bike building. I'm sure that Nineball would agree that it's well worth the effort. Hi Brad and Kat. I’m Wayne from Spokane, Washington. Enjoy getting your newsletters and being a part of the builders forum. I guess I’ve been a bike builder for most of my life, although I took a hiatus during college and in my early parenting years. 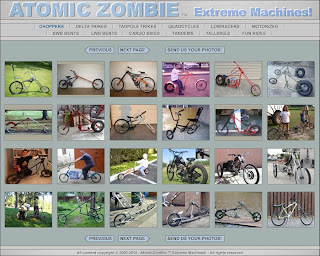 Now in my 40s, I got back to bike building a couple of years ago and luckily found Atomic Zombie. I really enjoyed reading the article in the February newsletter about the childhood memories of building a chopper bike with dad. I hope you will indulge me to tell you a bit about my memories. I grew up in New Jersey, one of six siblings. Our small house was crowded and even though we didn’t have much growing up, our parents did a fine job of teaching us positive values. I learned a lot from my parents, especially my dad. He was an auto mechanic for over 40 years. In his spare time, which wasn’t very often some weeks, he would tinker on all kinds of projects in the basement workshop, making gizmos, gadgets and fixing mechanical things for a lot of people in our neighborhood. He’d spend hours and hours taking things apart, fixing them and putting them back together. Everyone appreciated his patience and skills. He just enjoyed always doing something useful instead of sitting in front of the TV. The “idiot box” is what he called it. Dad loved going to auctions and yard sales. He usually worked long hours at the garage until late at night, but he’d be up early Saturday mornings to read the newspaper and head out to find bargains. I used to love going with him on his treasure hunts. It was something that my brothers and sisters weren’t too keen about, so it was usually just me and dad. We’d go from auction to auction, yard sale to yard sale finding all kinds of stuff, most of which I thought was just junk. But dad had a keen eye. He knew the gems from the junk. On many trips Dad would pick up mangled bikes, bike parts, and tires, practically everything you can think of. He had lots of stuff in the basement but always knew where everything was. There was no order to his stuff, at least that’s what I thought. One day, we found an old cruiser style bike at a yard sale. I remember that it was pretty beat up, the front tire completely twisted. Dad had a twinkle in his eye because it looked like a bike he had when he was a kid. I didn’t see anything special about it. Boy, was I wrong! We got home and we brought the day’s treasures to the basement. Dad said we were going to work on restoring the old bike, give it new life. I can’t remember how many hours we spent in the basement workshop taking the entire bike apart, working out the dents, replacing the chain, pedals, and wheels, sanding down the frame and repainting it. It took us a few days of spending all day and night in the shop bringing the old bike back to life. 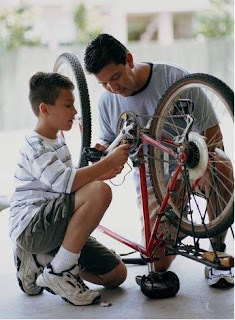 During that time, Dad explained to me everything we needed to do, showed me how to use the tools, take parts of the bike apart and put the bike back together again. It was quite an education. I loved every minute of it. Not only was I learning and doing something I really liked, I was spending quality time with Dad. That was the best part. We painted the cruiser bright yellow, Dad’s favorite color. I remember that the handlebars were super shiny. We spent a long time buffing up the handlebars and cleaning every part so they looked practically brand new. Nobody could believe that we turned that piece of junk bike into a work of art. Dad was so proud. I was proud, too. We both took the cruiser for a spin around the block to show it off. That was a great day. I wish to this day that we had before and after pictures of that bike. It was a special project, one of many that Dad and I worked on together, just the two of us. I have no idea how many bikes we worked on together. We did make some pretty wild looking choppers with ridiculous ape hanger handlebars and lots of shine, some with tassels on the ends of the handlebars. I learned so much about my Dad during those times together. We had many laughs, like how much dirt and grime I managed to get on my face! Looking back, I appreciate how important those times were to both of us. As I get older, I find that I forget more and more about the past, but some moments like scrounging for bikes and parts and building bikes with my dad are memories that I will always cherish. Spending time with your kids is so important to you and them. I know we’re all very busy and sometimes we forget to set aside that quality time regularly. Dad died suddenly over 10 years ago. He was my best friend until his last day here. But those memories will be with me forever. My son, Jared, is nine and my daughter, Adrienne, is 12. They love building bikes with me in the garage. Not every bike project is a success. Regardless, we still have fun mixing and matching parts to make something different. And yes, we go to yard sales and auctions together! It’s become a family tradition that we look forward to almost every weekend. I want my kids to learn and appreciate the time and effort it takes to make things themselves. To take bits and pieces and create something they are proud to call their own. I want them to learn the values and skills that I learned from my dad, all the while making it a fun experience, too. I think that’s as important as the learning part. Some of their friends come over to help or just to watch as we make some pretty funky rides. Their friends say my kids are lucky to have a “cool” dad. I think I’m lucky that I had a cool dad who gave me so many special memories that I can pass along to my own kids. I’m thankful for that every day. Thanks for sharing this wonderful memory with us, Wayne.